Not to mention One51’s other balance sheet holdings – investment property, private equity fund investments, 4%+ stakes in ThirdForce & IFG Group (IFP:ID), and a 26.9% stake in Augean (AUG:LN). [With further renewable energy investments still to come in Island Renewable Energy (80% stake), and Pioneer Green Energy (13.7% stake)]. And don’t even get me started on the potential friendly/hostile public takeover bids that were being considered by One51 at the time…most famously, the active role it played (via Moonduster, a JV with the Doyle Group) in the long-drawn out (& ultimately unsuccessful) bidding war for Irish Continental Group (IR5B:ID). Of course, the strategic logic (or lack thereof) of the overall portfolio was academic at that point…as a cash-burning & over-indebted One51 was forced to face up to collapsing asset values, investor risk aversion, evaporating bank facilities & an accelerating economic recession. All exacerbated by the fact much of its own balance sheet was effectively trapped in minority investment stakes, over which One51 could exercise little or no control. 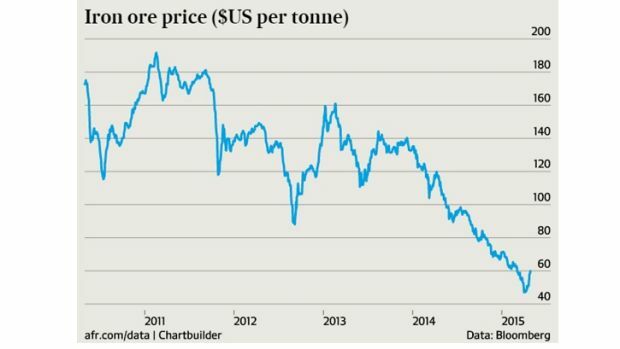 From a EUR 6.10 peak at the end of Oct-2007, the share price collapsed by an astonishing 98%, reaching a Dec-2012 low of just 15 cents per share! Considering the scale & timing of the decline, clearly it wasn’t just another post-crisis markdown. In fact, at its low, the company’s market cap amounted to just EUR 19 million – vs. 111 million of bank debt & CLNs – obviously attesting to the widespread investor belief at the time that One51 was locked into an inevitable death-spiral. And based on 2014’s free cash flow, disposals & share placing, One51’s now in the best shape ever: Equity’s increased by 55%, while net debt (exc. CLNs, which are now minimal) has been reduced to a mere EUR 7.4 million, with 114 million+ of banking facilities (inc. a new commitment from HSBC) now extended ’til Jan-2019. 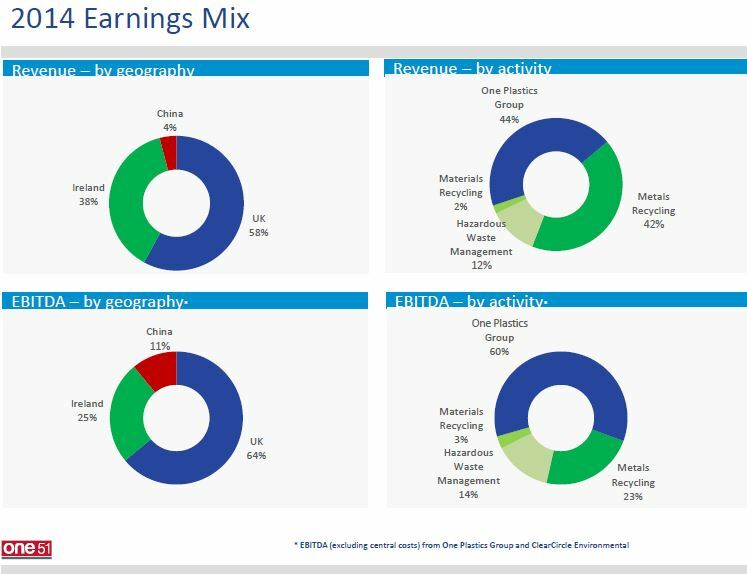 All of which was accompanied by increasing revenue, EBITDA & adjusted earnings. – One51’s 23.6% stake in NTR plc is an obvious crown jewel – there’s no need to rehash the story here, as I documented it in detail last year & just recently (I recommend you read here & here). Alan Walsh is a director of NTR, so he’s well positioned & highly motivated to accelerate the timing & maximise the pricing of the proposed tender offer. And NTR’s latest announcement confirms receipt of a net USD 195 million from its recent wind farms sale – unfortunately, management has also (finally) confirmed this figure is gross of fees & minority interest (with 10% to remain in escrow ’til Nov-2016). But logically, this presents no real issue, as NTR’s resulting cash on hand should still amount to at least EUR 198 million (inc. 47 million of existing balance sheet cash) – which is more than sufficient to fund the proposed tender offer in full. [That’s based on the assumption Tom Roche & management do not sell any shares in the tender]. Plugging a current 1.1006 EUR/USD rate into my most recent NTR model, and specifically tweaking for the highlighted deal fees & minority interest, I now arrive at a EUR 3.18 NAV per share for NTR (all else being equal). For One51’s 23.0 million NTR shares, a tender offer at that level would correspond to a potential (tax-free) payout in the near future of EUR 73 million. [When added to the company’s existing cash, plus its undrawn banking facilities, this represents a substantial war chest. And management’s clearly been busy evaluating & lining up one or more acquisition targets, so we can be pretty sure they’re now planning to pull the trigger (esp. on the back of an NTR tender offer). This acquisition strategy may trump it, but there’s still also potential for a post-NTR distribution to One51’s shareholders. A tender offer would be logical, but might be considered problematic (vs. last year’s EUR 0.90 share issuance), so a return of capital is possibly a more viable option]. – A 4.3% stake in OpenHydro is carried on the books at EUR 2.1 million. This compares to the EUR 8.5 million received from DCNS (in 2013) for its acquisition of 46% of One51’s original stake. 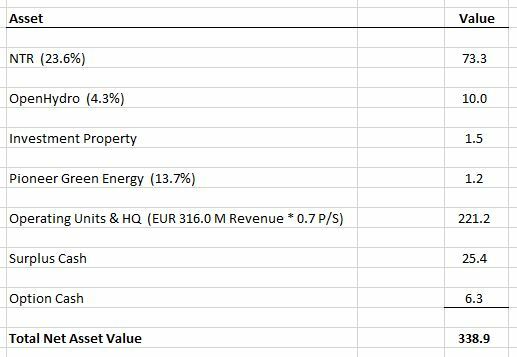 Based on OpenHydro’s subsequent newsflow & performance, and noting the lack of reason(s) cited for its subsequent write-down, I see little reason to depart from the prior valuation benchmark – which pegs the remaining stake’s value at EUR 10 million. – A 13.7% stake in Pioneer Green Energy is now held on the books for EUR 1.2 million. 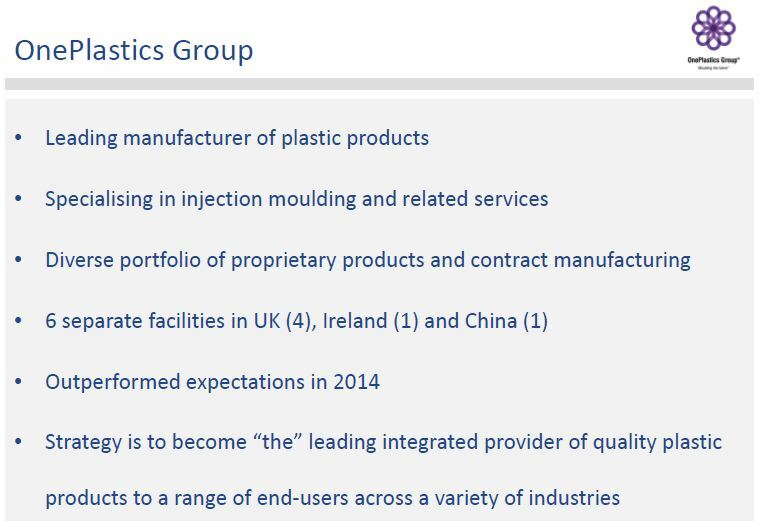 Noting Alan Walsh remains a director, and that One51 received EUR 3.8 million in distributions from Pioneer in the last year alone (p. 14 of the 2014 final results presentation), further gains wouldn’t be surprising. But with no further info. to reference, my increased OpenHydro valuation will serve as a catch-all for potential Pioneer gains. – A residual book value of EUR 1.5 million for investment property looks pretty reasonable. – We should exclude certain components of EBIT: i) a EUR 0.4 million JV profit (from Greenore Port, sold in 2014), ii) a 0.3 million discontinued ops. profit (from Irish Pride, also sold), and iii) 0.4 million of property rental income (see Note. 4). And noting the recent EUR 5.1 million HQ sale & leaseback, we’ll also deduct a EUR 0.3 million annual lease cost (assuming a 5% cap. rate). This actually pegs adjusted EBIT at EUR 11.7 million, a 4.2% margin. But clearly this margin isn’t very representative of what the division/units would hope to earn on average (or on a peak basis) across the economic cycle. We also know the units have been comprehensively restructured over the past few years & now appear to be well capable of withstanding further challenges, if necessary – conversely, we also know they’re potentially far more leveraged now to economic growth and recovery (in the UK & Ireland). 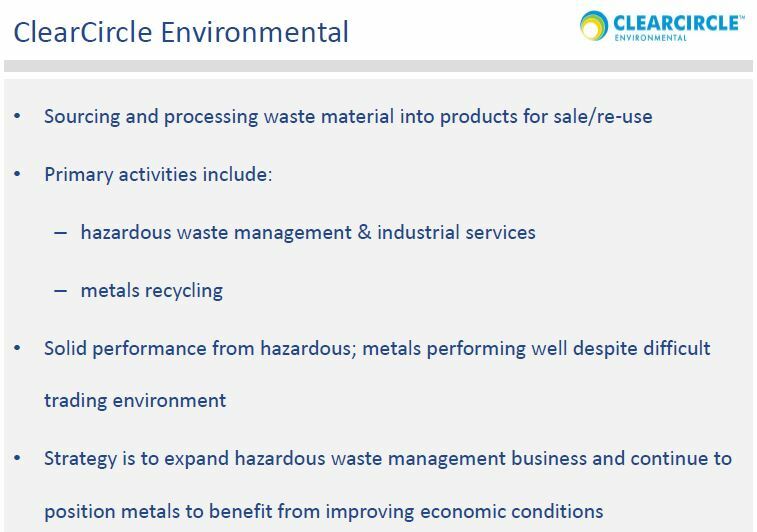 [Metals recycling is notably correlated to the level of construction activity, but there’s typically a time lag from construction commencing ’til waste enters the recycling chain]. All of which suggests more normalised margins (for each unit) are appropriate for valuation purposes. 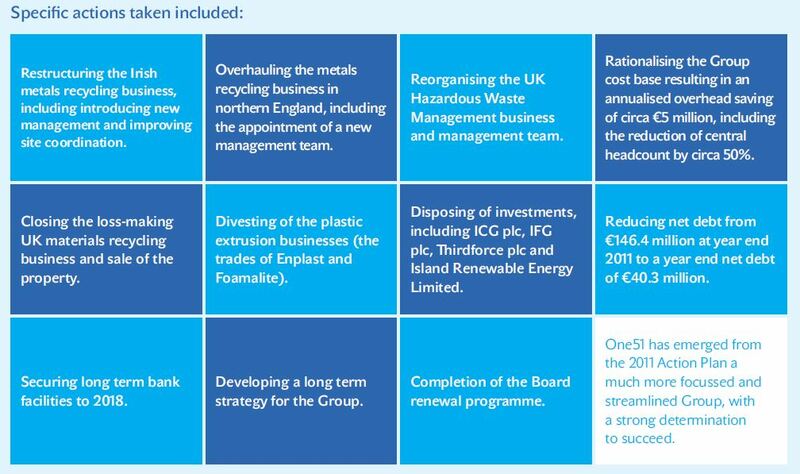 Let’s revisit the 2008 Annual Report (p. 19) – we see Environmental Services (which included both ClearCircle & OnePlastics at the time) actually earned an 11.2% EBIT margin on EUR 365 million of revenue. Not surprisingly, it did even better in 2007, earning 13.4% on EUR 161 million of revenue…in fact, the margin may have been as high as 17.6% (pre vs. post-exceptional?). Let’s just average ’em out, to arrive at a 15.5% peak margin. Despite single-digit year-end net debt, 2014 finance cost was actually EUR 3.9 million due to One51’s gross cash & debt positions. [Oddly, cash flow finance cost was EUR 7.2 million…though a yoy change in the language employed in the notes suggests amortisation vs. (once-off?) payment of specific finance costs might be an explanation (maybe related to One51’s re-financing last year?). 2013 cash vs. P&L finance cost also suggest some potential timing differences]. But noting an average 3.57% debt cost at year-end (which makes sense), deriving a new run-rate from the 2014 P&L finance cost certainly seems reasonable. Noting year-end bank debt of EUR 65 million & elimination of most outstanding CLNs/interest, I’d estimate what I think is a pretty conservative EUR 3.3 million finance cost for 2015 – and I’m ignoring any prospect of 2015 free cash flow & debt pay-down, so there’s plenty of wiggle room here. Working with a EUR 316 million revenue run-rate & an actual (current) operating margin of 3.8%, we get to a 12.0 million EBIT. 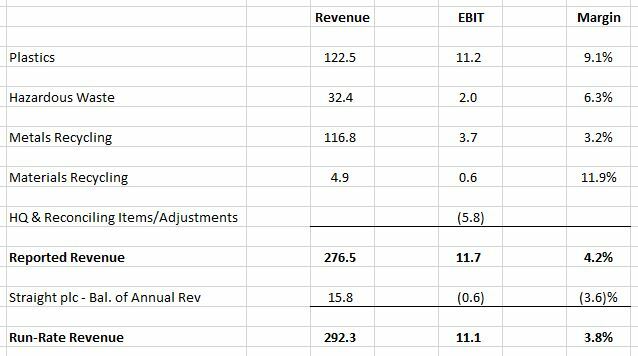 That pegs estimated finance cost at 27% of EBIT – which I wouldn’t necessarily consider sustainable. But One51 has plenty of cash on hand now: So if we choose to allocate just over half this cash (EUR 34 million) to debt reduction, One 51’s debt burden & finance costs would reach a sustainable 15% of EBIT. Which would also leave EUR 25 million of surplus cash to be included in my SOTP analysis. Below, I conservatively assume all outstanding options will be vested/exercised – accordingly, One51 can expect to receive EUR 6.3 million of cash as holders exercise these options. Currently, there are 157.0 million One51 shares outstanding, offset by 0.4 million of treasury shares. In addition, there are 10.3 million options outstanding (see Note. 31). Judging by the volume of options & the low strike prices (EUR 0.20 & EUR 0.90), it’s prudent to assume all options will be ultimately exercised (accordingly, we’ll also include the benefit of option exercise cash received). That puts total net (diluted) shares outstanding at 166.9 million. A EUR 2.03 Fair Value per share now offers investors Upside Potential of 45%. 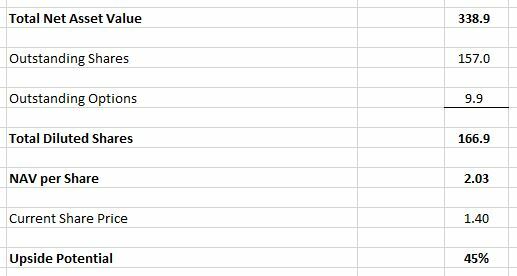 Maybe that seems a little tame compared to some of my other investment write-ups, but it’s important to remember intrinsic value upside (at a particular point in time) may ultimately prove to be only a relatively small component of one’s overall medium/long term investment return. By which I mean: A company/stock’s ability to compound is almost inevitably more important than how cheap it might be temporarily. Of course, that’s not intended to be an invitation to pay for growth at any price…but here we have a share price vs. an intrinsic value that offers 45% upside potential, and also a decent margin of safety. 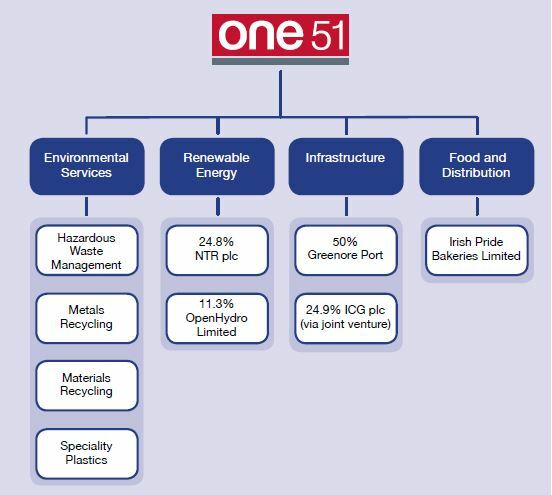 One51 has essentially eliminated its (net) debt burden, it has a OnePlastics division that’s marching along nicely, and its ClearCircle division is pro-cyclical & perfectly placed to now benefit from continued growth in the UK & an accelerating Irish recovery. Its stake in NTR is poised to deliver a substantial value/liquidity event. It’s also actively assessing other possible acquisition opportunities, and now has significant fire-power in terms of cash & undrawn debt facilities. And it has a 38 year old CEO who’s already made his bones as a turnaround guy, and wants & needs to prove he can now deliver a compelling organic & acquisition growth story…while also reassuring shareholders he’ll avoid the potential horrors of a debt-fueled spendthrift acquisition strategy. One51’s also overhauled its structure, pushing operating functions down to its business divisions, and reducing central headcount & costs – promoting a more performance-based culture throughout the company, and a more dispassionate perspective towards potential future divisional investments & divestments. Management has also committed to a significant liquidity/value event for shareholders by 2016 – ideally, this will be an IPO. [One51 may first need to exit its stake in NTR, but otherwise it looks ready to me – the balance sheet’s clean, it’s transitioned to IFRS & KPMG’s been the auditor for years now, share capital’s been re-organised to permit dividends (& even share buy-backs), and Hugh McCutcheon (ex-Davy Head of Corp. Finance) is a useful director to have on board. Since liquidity’s perhaps the first priority here, a reverse takeover of an existing listed company might also be a possibility]. Finally, we can be reassured by some of the names we see on the share register – a number of Irish co-ops & food companies (14.4%+), Pageant Holdings (8.0%), Larry Goodman (Vevan, who appears to have increased his stake to 4.4%), and maybe even Dermot Desmond (rumoured to have bought a 4.7% stake from Co-Operative Group last November…except there’s no sign of him on the register in the 2014 annual report), will obviously be actively pushing for a liquidity/value event to occur as soon as possible. And looking ahead, judging by their respective (prior) growth histories & the current inflection point we’ve now reached in the UK/Irish economies, both of One51’s divisions could enjoy a steady progression in terms of increasing revenues & expanding margins over the next few years – while a measured acquisition strategy would obviously add another powerful growth tailwind. Based on these potential drivers, it isn’t difficult to foresee an easy/medium term double for One51 shareholders…who can otherwise remain comfortable owning what’s now a financially stable company with a decent margin of safety & upside potential, coupled with some likely near term positive sentiment drivers (an NTR tender offer & a possible IPO). 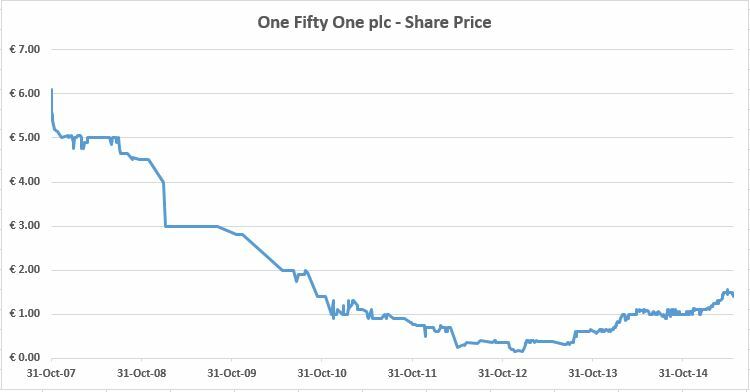 I currently have a 6.7% portfolio allocation to One Fifty One plc.